Today I’d like to take a closer look at Kingsway’s CD price comparisons, with specific reference to the Government’s Pricing Practices Guide: guidance for traders on good practice in giving information about prices (pdf, 422kb | Google Docs ‘Quick View’). If you’re brave (or foolhardy) enough to follow my personal blog you’ll recognise the first few paragraphs, adapted from my weekend post, Kingsway: dishonest discounts or fair practice? 1.6.1 You should not use a recommended retail price,	or similar,	as a	basis of comparison which is not genuine, or	if it differs significantly from the	price at which the product is generally sold. 1.6.2 You	should	not	use	an	RRP	or	similar	for	goods that	only	you	supply. Given that Kingsway’s RRPs are not generally charged by Kingsway themselves but are only used in their dealings with other traders, any claim that those RRPs are genuine seems a tad shaky at best; and since Kingsway are the sole supplier of Kingsway products — even when made available through other traders — then, with the best will in the world, I’m finding it difficult to see how Kingsway’s practice can be interpreted as anything but a deception, the ‘discount’ nothing more than bait to draw people in, the RRP a hook to hang it from. The deception may not be intentional, of course: most speeding motorists don’t intend to break the speed limit either — my concern here is not with intentions but consequences. The ‘pre-order’ offer period is over but the actual price now being charged by Kingsway is only £11.99: customers who thought they’d be saving £4.00 by placing a ‘pre-order’ have in fact only saved £1.00. 1.1.1 The CPRs [Consumer Protection from Unfair Trading Regulations 2008] prohibit traders from giving false or misleading information, or omitting material information, about price or the manner of calculation of the price for a product, where this causes or is likely to cause the average consumer to take a transactional decision he would not otherwise have taken. If you choose to make price comparisons, you should therefore be able to justify them, and to show that any claims you make are accurate and valid – in particular, that any price advantage claimed is real. Would “the average consumer” have taken the “transactional decision” to ‘pre-order’ this album had they known that the price was only going to rise by £1.00 rather than by £4.00? Only those who made that decision can answer that question for certain, but it seems fair to say that the price advantage claimed was not real. 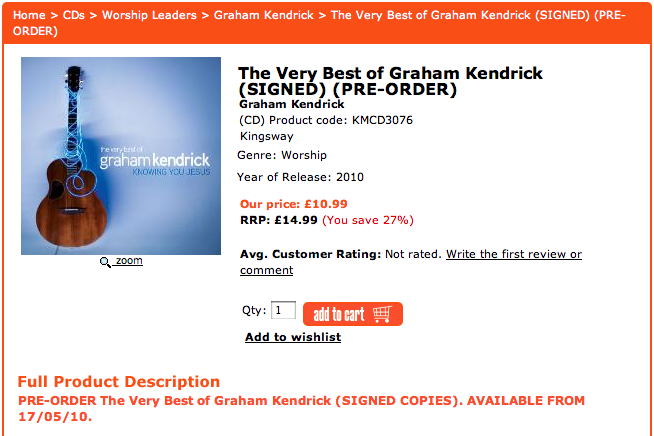 Will customers placing ‘pre-orders’ for this item really save £3.00, 23% off the advertised RRP? 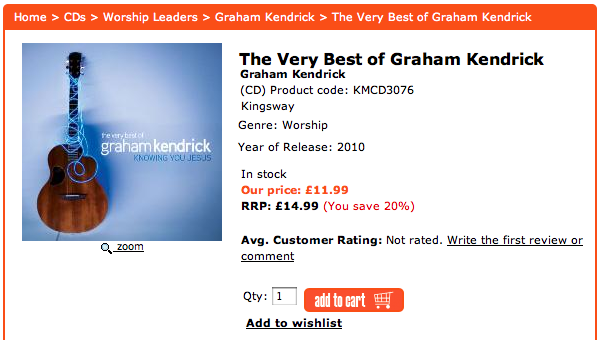 Or will the price simply go up by £1.00 as per the Kendrick album? 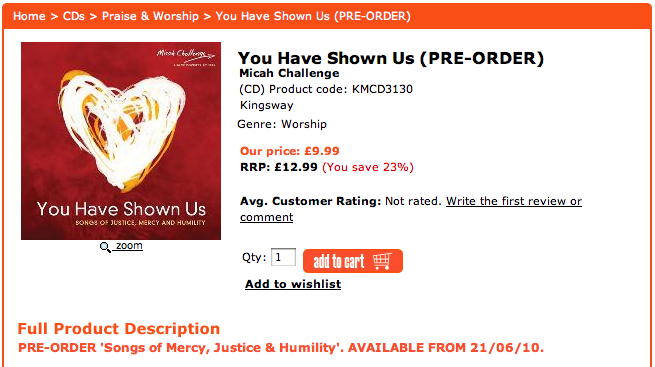 Will Kingsway rise to the Micah Challenge’s call for trade justice in their own business practices? Or will John Paculabo attempt to sidestep Micah’s challenge as he did when I cited Amos? Please stop misleading your personal customers and undermining your retail partners with your dishonest discounts and fictionalised RRPs. You make a beautiful noise — but that noise is no more than a resounding gong, a clanging cymbal if you build it upon dishonourable or deceptive business practices. Don’t just record songs about justice: practice it! The more i read of this & consider it, the more upset it makes me………..i say this tentatively but i find it hard to be enthusiastic about a trade where this can happen & keep happening …………and when someone brings it to the attention of others? Its reminding me of my experiences in “Christian events” – on a few occasions we questioned practices, suggested changes and strived to do things the right way in our dealings with labels & management …………the response? Threats, insults, ignored, lied to………we could & perhaps might write a book. But my point is, this stuff is depressing and should not be happening. I am glad that this matter was brought to light in the first place. That was and is needed. But, we are told how to bring things to another’s attention in Galatians 6:1 “in a spirit of gentleness” which is challenging when a public issue is in hand – which is why I appreciate Phil’s careful distinction between motives and practise today. But, at the very least this very Galatians text should exclude room for any sarcastic illustrations that have the danger to move into the area of the enemy’s regular accusations and mockery of the brethren. Today’s expansion of the issue and comparison with general good practise -irrespective of the Christian tag or not – is good instruction. But, in public too, since this blog is not limited to Christian viewing, we have to remember also the deal Paul highlighted: that of bringing fellow believers before the law (as per 1 Corinthians 6:1-11). The very evidence before us could make anyone mention these things to the Office of Fair Trading. And then, where would the name of Christ be praised in this? Is there a place for mentioning things privately and then perhaps others involved with the offending party following which we should leave it to the Lord? And then, if the practise continues just bring the occasional reminder in the present arena? What would be good is to know if there is an oversight or council of reference for Kingsway – if not, even the very church leaders the executives sit under – for it seems to me it is now high time they look into this. That would seem a good way forward with reference to my bible understanding. Thanks Jacques: appreciate your thoughtful response (and good to meet you last week, btw). For the record, concerns were raised privately with Kingsway long before we reached this point: by myself, at which point I advised Kingsway of my intention to blog, and invited their participation, because I felt that this was — and is — an issue that warrants further discussion in the trade; and, as per the Letters page in this month’s Christian Marketplace, by Michael Gibson. Kingsway’s responses thus far, via John Paculabo, have been, at best, dismissive if not actually contemptuous. Nonetheless, my invitation to John or to anyone else from Kingsway/David C Cook to respond remains open. May God bless us with tears to shed for those who suffer from pain, rejection, starvation and war so that we may reach out hands to comfort them and turn their pain into joy. This is not really a subject that should attract this amount of debate. Whatever the finer points of the RRP framework the reality is that Kingsway are likely to be referring to the normal price for catalogue albums. Go into your local HMV store and look in the A-Z section and you’ll find may albums retailing at around the £15 mark. Whatever the rights and wrongs of this issue, it has all the feel of a quite vituperative crusade against Kingsway, which is out of all proportion to the alleged “deceit” which is apparently being perpetrated. I noticed in one of the discussions on this issue that the word “illegal” was used (and the reference to government guidelines rather gives the impression that some “crime” is being committed). If Kingsway is doing something illegal, then I think they would know about it by now – courtesy of the “powers that be”! I can think of many dubious and serious practices going on in the Christian world, which are far more worthy of a prophetic denunciation than Kingsway’s price comparison policy. Again, while not justifying any “injustice”, I do think some perspective is needed, especially in the tone of the language used. Frankly, the insinuations on this blog are becoming almost slanderous – particularly against the person who is apparently attempting to “sidestep Micah’s challenge”!! I have had many dealings with Kingsway over the years, and I simply don’t recognise the company that is being spoken of here. It’s sad isn’t it, Al? But I can assure you that this Kingsway is the very same Kingsway: witness John Paculabo stepping forward in the company’s defence. You’ll find no vituperation here and no crusade against Kingsway: just straightforward questions about a questionable practice that won’t go away until Kingsway deal with them. And the “powers that be”? They’re unlikely to do anything unless the matter is drawn to their attention. I hope that things don’t come to that. Since when has the Daily Mail or Punch been a good guide on how Christians should conduct themselves when writing? … erm probably from about the same time Kingsway started conducting the issue being raised in the original blog post? *grin* yes I know a good christian probably wouldn’t have rejoindered – however as I willingly and frequently acknowledge i’m not a good christian… just a christian that is still a very definite work in progress. Kingsway are buildings schools and community centres in the Amazon via their Ray of Hope relationship. They have been key to the One Voice charity recordings for disaster relief. They have given support to literature ministry that serves 140 nations. They also gave major support to the Compassion Art project. No one denies that Kingsway as part of the David C Cook family are doing good works, but surely you must acknowledge that the Micah Challenge cannot be seen as just doing good works in isolation! The challenge is to be applied across the board, here as much as abroad and in ALL our relationships! Dave, as far as I’m aware no one is for one moment questioning Kingsway’s work elsewhere in the world and no one is questioning the excellence of most of their products. But does it not strike you as sad that a company that can excel in so many areas fails in such an elementary area here? As I said to John, when he challenged my citation of Amos, any attempt to divorce the way we do business with one another from our responsibilities towards the poor is mistaken at best, as Amos and numerous other biblical writers made abundantly clear to ancient Israel. Our commercial activities can’t be neatly separated from our social responsibilities, can they? Everything’s connected: trade justice applies globally, across the whole of our lives, whether we’re dealing with trade partners in the UK or people in any other setting. So, with all due respect, I disagree: Micah’s challenge applies as much to Kingsway at home as it does to its operations elsewhere. Ran out of nested replies. Yes – I am a frequent traveller on the Ship (mainly in Purgatory though). I still think the language has been intemperate for an arbitrary public forum. Nonetheless, if you or anyone else would like to point out specific examples of such behaviour, there is a general feedback page where concerns may be raised; and if any factual errors are brought to my attention they too will be addressed. « Free Carriage, No Minimum Order Value: the new Christian trade supplier standard?